Everyone loves potato salad. 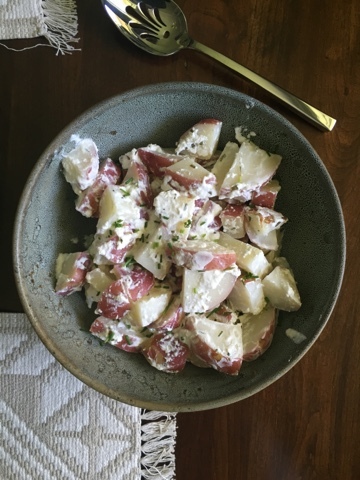 Granted, not everyone loves the same kind of potato salad, but I've yet to meet anyone who said they don't like potatoes covered in some sort of dressing whether it's vinegar-based, mayonnaise-based, or mustard-based. Now me? I'm an equal opportunity potato salad eater. There's a certain time and place for some made with mustard, the warm and vinegary German kind, or my Maw Maw's that has eggs and celery and red wine vinaigrette in addition to other delicious things. Sometimes, you need something different, something cool and refreshing. Enter my potato salad. It's a lighter take on a classically heavy dish. It's bright and fresh. And when it's too hot to eat anything heavy, it hits just the right spot. Begin by slicing your potatoes into bite-sized pieces. You can peel them first of you like, but I love the skins. Boil them until they can be easily pierced by a fork. Meanwhile, in a medium-sized bowl, mix the rest of the ingredients together. When the potatoes are finished cooking, gently toss them into the dressing mixture. You can serve immediately, or keep in the fridge until you are ready to eat. *These are just the proportions that I like for the salad. You can bump up or tone down any of these if you wish. And if you're a Greek yoghurt hater, try it first. The cream tones down the tang of the yoghurt. If you're still not convinced, you can use sour cream and cut back on the heavy cream. One year ago, Harrison and I went on our first date. I had imagined what it would be like to spend an evening with the most genuine, interesting, adored-by-everyone, and seemingly unattainable man I had ever met. I dreamed for six months. He had asked me out nine days prior to our date, and the wait was finally over. When we spoke on the phone earlier that morning, all nerves left me. I was bubbling over with excitement! At 7pm, we were ready to go. I hardly remember eating my salmon at Boscos. We sat and talked for four hours in that restaurant, trying to play it cool and not revealing how elated we both were to be with each other. He "missed" the turn back to the Pace's house so we could have an extra three minutes together. 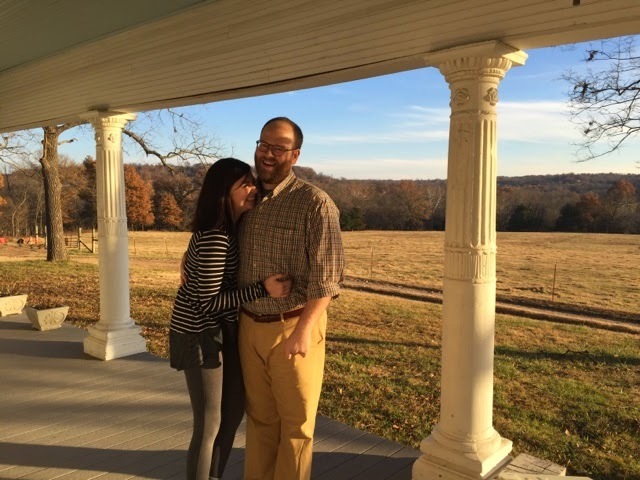 Forty-five days later, I had a ring on my finger. Now, we are about celebrate six months of marriage. I never dreamed that I would ever love someone so much, and it's crazy to think about how much that love grows every day. So here's to the man who finishes my sentences, takes care of the two of us, is handy beyond belief, knows about everything, eats the good and bad food I make, and brightens my days. Hey there! I'm Melanie; I love my husband, food, all things British, the colors black and white, and coffee.